Are there any fees associated with CM/ECF? Can an attorney file a document ex parte? Can an attorney file a Notice of Appeal electronically and pay the fee online? Can attorneys file case initiating documents, such as complaints and Notices of Removal, electronically through CM/ECF? Can attorneys file sealed documents in civil (cv), criminal (cr), or magistrate (mj) cases using CM/ECF? Has the implementation of CM/ECF changed the way discovery is filed? How can I obtain a refund from PACER for items marked on my quarterly bill as "free looks" for which I incurred a PACER charge? How do attorneys access an electronically filed PDF document through the Notice of Electronic Filing (NEF) Email? How do attorneys sign joint pleadings electronically? How do I file a pleading for another attorney in my firm while they are either on vacation or out of the office on other business? How do I sign up for PACER (Public Access to Court Electronic Records)? How do support staff access an electronically filed PDF document through the Notice of Electronic Filing (NEF) Email? How should proposed orders be submitted to Northern District of Florida Judges? I received a message indicating that the email address associated with my account is invalid. What should I do? If I create a report in CM/ECF will I receive information from PACER about the potential cost of that report prior to being billed? In which case number should pleadings be e-filed in cases concerning Motions to Vacate under Section 2255? Is access to a PDF document through the Notice of Electronic Filing (NEF) free for everyone in my office who has received a copy of the NEF? Should sensitive information be included in any document filed with the court? What are the hardware and software requirements for filing documents using the CM/ECF system? What are the user requirements for filing documents via CM/ECF? What does it mean if I receive an NEF email, click on the case number hyperlink, and see a CM/ECF screen with a yellow background? What if I cannot pay the filing fee? What is the deadline for the timely filing of a document via Electronic Case Filing (ECF)? What is the proper format for adding parties through CM/ECF? What should I do if I have successfully registered for ECF but have not been receiving the Notice of Electronic Filing (NEF) emails? What should I do if I make a mistake while opening a new case in CM/ECF? When I search for an existing party to add to a new case, must the party name exactly match the name found on my Complaint? When should the event "Amended Document (NOT motion)" be used by an attorney? Where can I find detailed information about using the ECF system? Where can I find the Notice of Removal event, and can I use it to open a case electronically? Why am I having trouble viewing PDF documents through the docket sheet? Why am I receiving the message "ERROR: This document contains embedded links (annotations and/or hyperlinks). This PDF document cannot be accepted."? Why can't I find categories for posting discovery related documents? Why can't I see all or some PDF documents that have been filed in criminal or social security cases? Why has my county Sheriff's Office returned issued FLND civil summons forms to me indicating that they cannot be served because they are copies? Why must I answer questions about the filing of an Application to Proceed Without Prepayment of Fees and/or whether or not I am filing on the behalf of the USA or as a Court Appointed Attorney when I open a new case electronically? Will I be billed by PACER if I access a PDF document through the Notice of Electronic Filing (NEF) more than once? Will I be billed by PACER if I click on the docket sheet report hyperlink located on the Notice of Electronic Filing (NEF)? There are no additional fees for filing documents over the Internet using CM/ECF; existing court document filing fees do apply. A Public Access to Court Electronic Records (PACER) user ID and secure password must be obtained in order to utilize the Notice of Electronic Filing (NEF) emails that will be sent to the attorney of record and to their two copied recipients (if applicable) each time an entry is made in a case. The attorney of record's primary email address and secondary email addresses will receive a "free look" at the PDF document. Yes. The various Notice of Appeal events have been programmed to allow attorneys who need to pay the appeal filing fee the opportunity to do so via pay.gov. Case initiating documents, e.g., Complaints and Notices of Removal, may be filed electronically by attorneys authorized to practice in this district as long as payment is made through Pay.gov during the docketing process using a credit card. At this time, all sealed documents must be filed in paper with the Clerk of Court during normal business hours. Documents traditionally filed with the court should be filed electronically using the CM/ECF system. Documents, including Discovery-related materials, that are traditionally not made a part of the court record but are served on all counsel of record should be served traditionally (without the use of CM/ECF). Yes. The Judicial Conference Committee on Court Administration and Case Management has issued a Report on Privacy and Public Access to Electronic Case Files. In addition, the Clerk of Court has also issued a privacy notice. NOTE: As of November 1, 2004, the public may access public PDF documents filed in public criminal cases through PACER as long as the file date is equal to or greater than 11/01/2004. If you have any questions regarding the PACER refund process, please call (800) 676-6856. Attorneys in the San Antonio, Texas area may contact PACER by calling (210) 301-6440. Click the document number hyperlink (appearing as an underlined number in blue on the NEF) to cause a login screen to appear. Next, input your login and password, when prompted.. If the e-filing involved only one PDF file, then Adobe Reader will load and will give you access to view, print, and save the file. If the e-filing involved multiple documents, then you will be presented with a list of the associated documents and their descriptive names. The first document in this list will be labeled "Main Document". Accessing this PDF will not cause you to incur PACER charges if you have logged in as the attorney of record in the case. Accessing all subsequent documents in this list will result in PACER charges at this time. If you find that you have been charged for a "free look" document by PACER, follow the instructions under the question "How can I obtain a refund from PACER for items marked on my quarterly bill as "free looks" for which I incurred a PACER charge?" The first attorney prepares the pleading and adds his or her electronic signature in the form of s/. The attorney then sends the electronically signed pleading to opposing counsel in word processing format by e-mail. Upon receipt, that attorney will then sign the pleading electronically using the s/ method and will convert the pleading to PDF. At this point the joint pleading may be posted in CM/ECF, or in the alternative, the PDF file may be sent back to the originating attorney by e-mail for subsequent posting. Attorneys should discuss and agree on the applicable procedure. Contact information for the PACER service center can be found on the PACER contact page. Northern District of Florida Local Rule 5.4 allows a person "authorized to act on behalf of a Filing User" to use an attorney of record's password and login to e-file pleadings in a case. In addition, attorneys admitted to practice within the Northern District of Florida may file pleadings on behalf of another using their own CM/ECF password and login. The user authorized to e-file using the attorney of record's password and login should prepare the pleading so that the s/ signature and the signature block reflect the name of the attorney of record in the case. The authorized user may then e-file the pleading using the attorney of record's password and login. An attorney who has been admitted to practice within the Northern District of Florida and who has received authorization from the attorney of record in a case may file pleadings on behalf of that attorney using their own CM/ECF password and login. The signature block on the pleading should contain the filing attorney's s/ signature and should also include a reference to the attorney of record in the case on whose behalf they are filing. Attorneys choosing to employ option 2 will receive notification from CM/ECF during the docketing of the pleading that they are not an attorney of record in the case. If you do not plan to represent the associated party, then you may click the "next" button and continue with the event. Attorneys who choose to skip the party/attorney association screen will not receive NEFs in the case. Visit the PACER site to register for a PACER login. Support staff access PDFs in a similar manner as attorneys. Mouse-click the document number hyperlink (appearing as an underlined number in blue in the NEF) to cause a login screen to appear. Input the non-attorney user's PACER login and password. Documents in Social Security cases can only be viewed after the system verifies that the user has entered the FLND-issued login and password of the attorney of record in the case. A PACER login is sufficient for all other case types and for PDF documents filed in criminal cases on or after 11/1/2004. If the e-filing involved only one PDF file, then Adobe Reader will load and will give you access to view, print, and/or save the file. If the e-filing involved multiple documents, then you will be presented with a list of the associated documents and their descriptive names. The first document in this list will be labeled "Main Document". Accessing this PDF will not cause you to incur PACER charges if you are the attorney of record. Accessing all subsequent documents in this list will result in PACER charges at this time. Please see the proposed orders notice for detailed information. Contact a member of the Clerk's Office for assistance. In most instances, PACER will notify the user if certain access will result in the incursion of fees. The user will then have the option to "view" or to cancel the action. All pleadings in 2255 cases should be e-filed in the criminal case only. Nothing should be filed in the associated civil case. You should not include sensitive information in any document filed with the court unless such inclusion is necessary and relevant to the case. File a reference list under seal. Please consult the privacy notice that has been posted to this web site for more information. A Pentium (or equivalent) computer running a standard operating system. An Internet connection. Cable or DSL is strongly recommended. Firefox 3.5 and Internet Explorer 7 and 8 have been tested and certified to work with CM/ECF. Adobe Acrobat Standard or other software designed to convert word processing documents to portable document format (PDF). Note: Word 2007 or higher includes a utility that will convert .docx files to .pdf. Word Perfect 9 or higher includes a utility that will convert .wpd files to .pdf. A scanner to image documents that do not exist in electronic format (e.g., maps, photographs, etc.). An imaged .pdf is not searchable, therefore, text .pdf files are preferable when submitting documents that already exist in an electronic format. One must be an attorney admitted to practice in the United States District Court for the Northern District of Florida. A PACER user ID and secure password must be obtained by contacting the Public Access to Court Electronic Records (PACER) service center at 1-800-676-6856. An attorney who electronically files a document with the attorney’s handwritten or electronic signature—or who authorizes another person to electronically file such a document — is responsible for the document just as if it had been filed in hard copy with the attorney’s handwritten signature. And a party is responsible for a document electronically filed on the party’s behalf with the party’s or an attorney’s handwritten or electronic signature, just as if the document had been filed in hard copy with the party’s or attorney’s handwritten signature. The yellow background signifies that you are looking at the court's CM/ECF TRAIN database and that the NEF was sent to you in error. If you are unable to pay the filing fee when you submit your complaint or petition, you must request a fee waiver by filing a motion to proceed in forma pauperis and the accompanying financial affidavit. You may request an in forma pauperis application from the Office of the Clerk of Court. The Judge assigned to your case will review your affidavit to determine whether your motion can be granted. If so, the Clerk will be directed to file your case without payment of the filing fee. Prisoners who are unable to pay the filing fee should use the prisoners' motion to proceed in forma pauperis. NEF stands for Notice of Electronic Filing. This notice is sent by email to all attorneys of record (and up to two members of their staff) who have registered for Electronic Case Filing (ECF) each time an electronic document is filed. Attorneys may also opt to receive NEFs in a summary e-mail that will be sent to the attorney once per day. The Case Management/Electronic Case Filing (CM/ECF) system is the Federal Judiciary's comprehensive case management system for all bankruptcy, district and appellate courts. CM/ECF allows courts to accept filings and provide access to filed documents over the Internet. CM/ECF keeps out-of-pocket expenses low, gives concurrent access to case files by multiple parties, and offers expanded search and reporting capabilities. The system also offers the ability to: immediately update dockets and make them available to users, file pleadings electronically with the court, and download documents and print them directly from the court system. 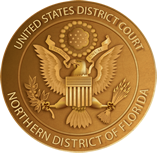 The Northern District of Florida is a NextGen CM/ECF court, allowing attorneyrs to use a PACER account for both viewing and electronically filing documents. All electronic transmissions of documents must be completed prior to midnight of the local time of the division in which the case is pending in order to be considered timely filed that day. All parties should be added using UPPER CASE letters with no punctuation unless the punctuation is a part of the name, e.g., Wal-Mart, O'Bryan, and hyphenated last names such as Smith-Jones. Only individuals or entities considered to be a party to the case should be added when required. Individuals to be served as a matter of law (i.e., the United States Attorney for this district or the United States Attorney General) should not be added to a case unless they are specifically named on the complaint. Generation Field = JR The "Title" field should always be blank. Title or other descriptive information should be added to the "Party Text" field. See the Attorney's User Guide and the Style Guide for Electronic Case Filing for more details. First, contact the Clerk's Office nearest to you and inform them that you are not receiving NEFs. Some Internet Service Providers (ISPs) automatically treat NEFs as spam. Therefore, check with your provider to determine if this is the case. Your email system may be automatically sending NEFs directly to your trash folder. If this is the case, consult with your local technical support person or your ISP to determine how to change this setting. Contact your local Clerk's Office if technical problems persist. Call any Northern District of Florida Clerk's Office for assistance as soon as you recognize that a mistake has been made and before aborting the case opening process. While we would prefer that the case opening process not be aborted until after you have spoken with a member of Clerk's Office staff, we recognize that you may be working after business hours when a problem has been encountered. If so, please make a note of the failed case number and report it to a member of Clerk's Office staff the next business day. In addition, it is very important that you refrain from listing the failed case number as a related, lead, or member case of any subsequent corrective case opening. If you are new to the electronic case opening process, then we suggest that case openings be performed during normal business hours so that we may provide training assistance to you. Yes. Parties should be added to cases so that they appear on the docket exactly as they appear on your case initiating document. If a matching party does not exist in the database, then the attorney should add a new party in accordance with the formatting requirements found in the Style Guide for Electronic Case Filing. "Amended Document (NOT motion)" was created to allow attorneys to amend a previously filed document that is not a motion. This event allows the user to upload a PDF document and link or make reference to an existing document. Reasons for amending an existing filing may include the need to correct existing docket text or to correct an improperly formatted PDF document. An attorney e-files a "Report of Rule 26(f) Planning Meeting" using a scanned PDF document. The next day, the attorney is notified by the clerk that the scanned PDF is incomplete and improperly oriented on the screen making it unreadable. To correct this error, the attorney should re-scan the Report and e-file the corrected PDF using the event "Amended Document (NOT motion)". During the e-filing process, the event will allow the user to create a link (or a reference) to the original entry, upload the corrected PDF document, and add text to indicate the reason for the re-filing (e.g., "see corrected PDF document"). E-filing using the event "Amended Document (NOT motion)" will produce a Notice of Electronic Filing (NEF) causing the corrected PDF to be electronically transmitted to all attorneys of record who have registered for ECF. NOTE: The amendment of motions should be accomplished by e-filing the motion using the proper motion relief type (e.g., "for extension of time", "for leave to file", etc.) and selecting "Amended" from the drop down menu that appears on the text edit screen found during the latter portion of the event. Documentation and training for CM/ECF can be found on the CM/ECF Information page. The Notice of Removal event may be found in the CIVIL menu under the hyperlink Complaints and Other Initiating Documents. One may also use the SEARCH option located in the blue menu bar to perform a keyword search for notice or removal to access the Notice of Removal event directly from the resulting search screen. Attorneys are strongly encouraged to open civil cases electronically, and the Notice of Removal event may be used for this purpose. Most problems viewing PDFs are related to problems with individual computers, and not with the CM/ECF system. Try clearing your browser's cache, first. In some cases, you may also need to contact a member of your Information Technology staff to troubleshoot the issue. If you continue to have problems, then please contact the Clerk's Office nearest to you. A restriction was added on December 7, 2009 that prevents e-filers from uploading portable document format (PDF) files containing hyperlinks to resources that reside on the Internet or to bookmarked locations within the document. The restriction also prevents users from uploading PDF files containing active email addresses (i.e., addresses that allow users to click on them within a PDF document in order to send an email). This change was necessary in order to promote continued system security. Click on the menu option Remove Hyperlink. Clicking the menu option Reveal Codes. At the bottom of the screen within the formatting window, place your mouse cursor between the last character in the hyperlink text and the Hyperlink formatting icon. Press the Delete key on your keyboard to retain the hyperlink text but remove the link. To close the formatting codes window, right click anywhere in the document, and left click on the now checked Reveal Codes option to turn off the option. Counsels' attention is directed to Federal Rule of Civil Procedure 5(d), which prohibits the filing of discovery materials (including notices of deposition, deposition transcripts, interrogatories and interrogatory responses and notices thereof, production requests and responses and notices thereof, and admissions requests and responses and notices thereof) and disclosures under Rules 26(a)(1) and 26(a)(2), unless and until needed for consideration of pending motions by the court. Discovery related posting events have accordingly been removed from CM/ECF menu options. An attorney of record's login and password must be used to view PDFs in restricted case types either through the docket sheet or through an NEF. Note that only court users have access to documents and cases that are sealed. The U.S. District Court for the Northern District of Florida utilizes electronic civil summons forms based on the summons form format guidelines found at Fed.R.Civ.P. Rule 4(a)(F) & (G) and rules regarding electronic signatures at Rule 5(d)(3). Electronic filing and signatures are provided for in Northern District of Florida Local Rule 5.1(A)(7). All county Sheriff's Offices located within the Northern District of Florida have been apprised of these rules via a letter from the Clerk of Court. Issued civil summons forms are available through the Docket Sheet for applicable cases filed electronically by attorneys. Issuance takes the form of the application of the issuing deputy clerk's s/name, the typed name of the Clerk of Court, and a digital representation of the court's seal to the form. The event used to document the issuance is called "Summons Issued". County Sheriff's offices should serve issued summons forms printed from the court's docket without questioning their format especially if they are delivered to law enforcement with a cover letter indicating that the United States District Court for the Northern District of Florida is an electronic court. If you answer y or Y in response to either question, you are telling the software to skip the screens involved in the collection of a filing fee via pay.gov. If you answer using any other character besides a capital or lower case y, then the system will proceed to the pay.gov screens. For example, the response of yes when filing a case involving a Motion to Proceed In Forma Pauperis or filing as a government or CJA attorney will not be properly identified by the system and will cause the user to progress to the pay.gov screens. The proper response in this instance would be Y or y. Attorneys of record are afforded one free look at a PDF document viewed through an NEF email. All subsequent viewings of that document will result in PACER charges. Users are encouraged to save the PDF document onto their firm's network drive or to the local hard drive (C:\) for subsequent access. Yes. Clicking on the docket sheet hyperlink found on the NEF will cause a PACER login screen to appear if you have not already logged into PACER that day. Once you have completed the login screen you will be presented with the current docket sheet for that case. Access to the docket sheet will result in PACER charges.